The digital signal processing is performed in a new, developed and manufactured by NEC Dynacord signal processor with 32 bit floating point technology, which achieves a dynamic range of 770 dB internally. Thus consuming internal operations are performed quickly and accurately even imperceptibly. The 16 bit A/D and D/A conversion corresponds to the current CD standard and allows the excellent studio moderate sound quality. There are 100 factory presets and 128 additional free user memories available. You can complete the data users benches along with their Midi settings stored on compact cassette or the like, or warden loaded into the Dynacord DRP 20. The Dynacord DRP 20 has a very comfortable Midi department that the advanced user Midi offers completely new possibilities themselves. For example, the external control of all parameters in real time (sequencer, keyboard) or simultaneous control of multiple parameters with a control function, or creating 5 different midi mapping tables, or more. 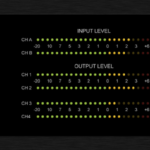 This subroutine allows individual, for the user freely definable presets (eg parameter values 0 “100 or in dB), and a variety of tests, including White Noise – and Pink Noise generation and more.